Al-Habash, PA Supreme Sharia Judge, says on TV 'Palestine will return to us,' all military and diplomatic options of 'resistance' are open. Palestinian Authority (PA) Chairman Mahmoud Abbas's adviser on Religious and Islamic Affairs assured in his televised weekly sermon last Friday that Israel will be destroyed, and that military options are being considered to make that happen. 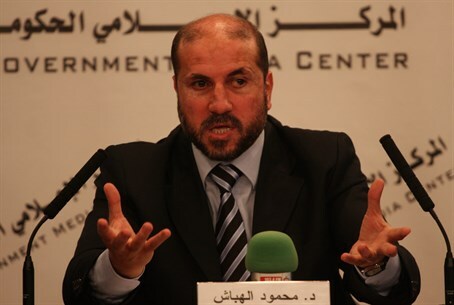 The comments made by Mahmoud Al-Habash, who also serves as PA Supreme Sharia (Islamic law) Judge, on the official PA TV channel were translated by Palestinian Media Watch (PMW). "All of this land will return to us, all our occupied land, all our rights in Palestine - our state, our people's heritage, our ancestors' legacy - all of it will return to us even if it takes time," said Al-Habash, indicating that Israel will disappear given the PA's claims to all of Israel. "Patience is the key to victory, and we are patient. In terms of resistance, all options are on the table, and in terms of diplomacy as well." The statement on "resistance" and "diplomacy" comes as the PA is poised on Wednesday to submit a proposal to the UN Security Council demanding recognition as a state and an Israeli withdrawal from Judea and Samaria within two years. In a London meeting on Tuesday, US Secretary of State John Kerry finally said the US would veto the motion while pushing for it to be postponed after Israeli elections in March, while PA chief negotiator Saeb Erekat vowed to submit the resolution this week anyway. Al-Habash has a history of revealing the PA's leanings for violence, having stated last month that Abbas is inciting religious war. In October, Al-Habbash taught that Islam prohibits accepting Israel's existence because the "entire land of Palestine" is Islamic waqf – an inalienable religious endowment in Islamic law. As such, he forbids making peace with Israel because he believes Islamic law prohibits "facilitat[ing] the occupation of even a millimeter of it", i.e., "the entire land of Palestine."